This year North Kiteboarding have come out with great value packages to get you out on the water with great savings over individually bought items and this Mono package is a great choice for any level or kitesurfer looking for an allround freeride kite, travel light and advance their riding on the Gonzales twin tip with strong capabilities on both directional boards and hydrofoils also! The Mono is a simple one-strut Allrounder with a focus on performance and handling. It is perfect for travelling and can perform on a twin tip, directional or foilboard. 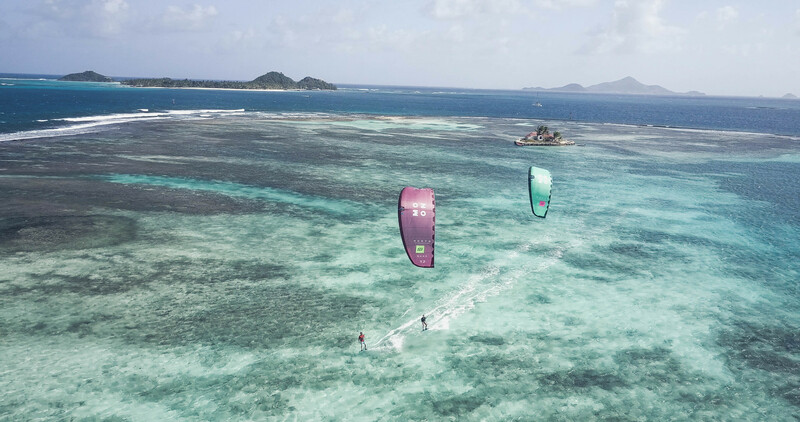 The smaller sizes are ideal for fast progression, freeriders, wave riders and foil boarders alike and its lightweight makes it especially good for lighter riders using it in less wind. The kite has amazing low-end performance, and it flies upwind with ease. The relaunch is very fast and easy; thanks to the Delta design the kite doesn’t stick to the water. The bar pressure is light, while there is a progressive power development as you sheet in, making it very easy to ride. Handling on the Mono is very dynamic, with fast, reactive steering the kite works well in all situations, also on foil boards. While the weight of the kite has been kept to a minimum, there are plenty of reinforcements in the right places to ensure it is very robust too. If you want a great all rounder with an incredible low-end for easy freeriding duties, the Mono is it! The Gonzales is an entry level kiteboard with a twist; it also has the ability to progress as you improve doubling up as a formidable freeride machine. The round outline offers excellent control while the soft flex makes it very forgiving. This flex pattern also ensures a smooth ride through the choppiest of water and the Mono Concave bottom gives you all the control you need during those early sessions during your kiteboarding career. Don’t get a beginners board that will leave you wanting more, get the Gonzales and get the most out of your sessions! For 2018 the excellent Trust Bar has some new features while retaining some of the superior functionality that makes this one of the best 4 line bars on the market.